October is a busy month here in From the Top land. Last week we taped a show in Troy, New York; this past weekend we taped one in Boston; we’re off to Greensburg, Pennsylvania in a few days, and then we round out the month in Davis, California! But will I manage to post my blog in a timely manner during this mad rush of shows? That, my friends, remains to be seen. Coolest cello case ever! 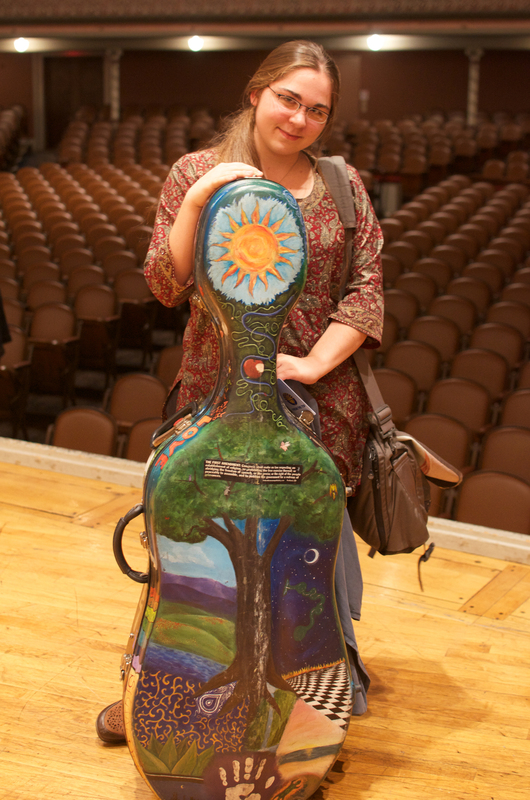 It was hand-painted by cellist Miriam Liske-Doorandish. But let’s start out on the right foot with a blog about our recent show in Troy! It was an all-cello extravaganza taped at the stunning Troy Savings Bank Music Hall. In addition to four phenomenal young cellists, we had the pleasure of featuring one of the master cellists of our time, Matt Haimovitz. He and Chris O’Riley are great friends and collaborators, and the two of them have been touring the country this year performing together. They also recently released an album called “Shuffle.Play.Listen.” which I encourage you to check out as it has quickly become one of my faves. Like Chris, Matt is well known for stretching the boundaries of classical music, and he regularly performs in unexpected places to reach new audiences. In the spirit of that, we set up an impromptu performance at a local bookstore during lunch hour on the day of the show. Matt and the four young cellists surprised customers at Market Block Books with an electrifying performance of John McLaughlin’s “Open Country Joy” arranged for five cellos! We caught the whole thing on video, of course, and will post it when the show goes live. You definitely don’t want to miss it. The taping that night was so exciting and full of truly remarkable cello playing, not to mention cello “drumming” (you’ll have to check out “Open Country Joy” to see exactly what I mean). Enjoy this week’s sneak peek – and don’t forget to tune in when the show airs the first week of December!